Celebrities were thick on the ground in New York at the "climate" march having jetted in in their private jets and limousines to tell the proletariat to reduce their living standards to "cure"the planet by reduction of consumption. Of course doubling of electricity and fuel prices is of no consequence to the uber-rich who exhorted the masses to do what they say and not what they do. Even with some of them having carbon footprints the size of small cities the hollywood hypocrisy is still lost on the true believers . 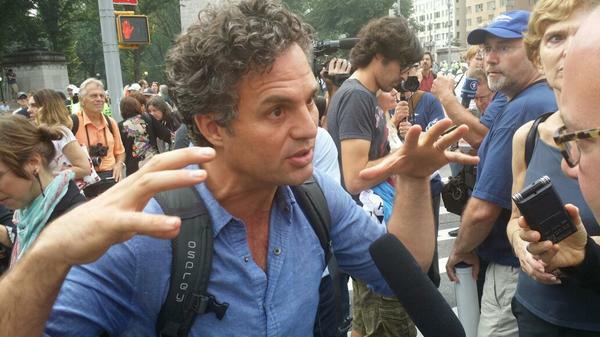 New York City – Actor Mark Ruffalo declared certain questions off limits to the media today at the People’s Climate March in New York City. “Oh brother. That is a question you shouldn’t be asking here today because that defies the spirit of what this is about,” Ruffalo told Climate Depot.